Researchers at QuTech in Delft have succeeded in generating quantum entanglement between two quantum chips faster than the entanglement is lost. Entanglement - once referred to by Einstein as "spooky action" - forms the link that will provide a future quantum internet its power and fundamental security. 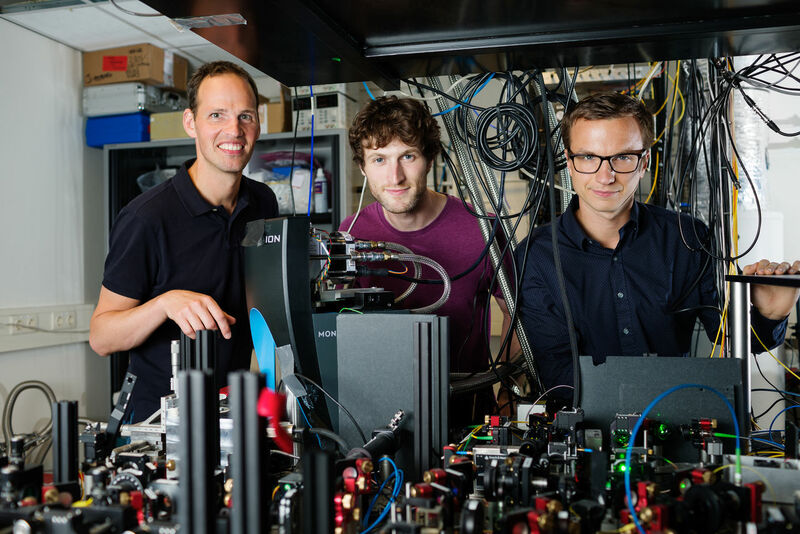 Via a novel smart entanglement protocol and careful protection of the entanglement, the scientists led by Prof. Ronald Hanson are the first in the world to deliver such a quantum link ‘on demand’. This opens the door to connect multiple quantum nodes and create the very first quantum network in the world. They publish their results on 14 June in Nature. By exploiting the power of quantum entanglement it is theoretically possible to build a quantum internet that cannot be eavesdropped on. However, the realization of such a quantum network is a real challenge: you have to be able to create entanglement reliably, 'on demand', and maintain it long enough to pass the entangled information to the next node. So far, this has been beyond the capabilities of quantum experiments. Scientists at QuTech in Delft have now been the first to experimentally generate entanglement over a distance of two metres in a fraction of a second, 'on demand', and subsequently maintain this entanglement long enough to enable -in theory- further entanglement to a third node. ‘The challenge is now to be the first to create a network of multiple entangled nodes: the first version of a quantum internet’, professor Hanson states. Researchers from QuTech in Delft working on the ‘entanglement on demand’ experiment’. The pictures show prof. Ronald Hanson, dr. Peter Humphreys and dr. Norbert Kalb, all from the group of prof Ronald Hanson of Delft University. In 2015, Ronald Hanson's research group already became world news: they were the first to generate long-lived quantum entanglement over a distance (1.3 kilometres), , allowing them to providefull experimental proof of quantum entanglement for the first time. This experiment is the basis of their current approach to developing a quantum internet: distant single electrons on diamond chips are entangled using photons as mediators. The scientists have now made multiple innovative improvements to the experiment. First of all, they demonstrated a new entanglement method. This allows for the generation of entanglement forty times a second between electrons at a distance of two metres. Peter Humphreys, an author of the paper, emphasises: 'This is a thousand times faster than with the old method.’ In combination with a smart way of protecting the quantum link from external noise, the experiment has now surpassed a crucial threshold: for the first time, entanglement can be created faster than it is lost. Through technical improvements, the experimental setup is now always ready for 'entanglement-on-demand'. Hanson: 'Just like in the current internet, we always want to be online, the system has to entangle on each request.’ The scientists have achieved this by adding smart quality checks. Humphreys: 'These checks only take a fraction of the total experimental time, while allowing us to ensure that our system is ready for entanglement, without any manual action'.